Looking for love or in need of a holiday? Head down to the Love Island villa where you might find a guy or girl who is 100% your type on paper. You'll also get to soak up the sun and play lots of exciting games. Love Island Bonus is a 5 reel, 25 payline slot which is based on the well-loved reality show 'Love Island'. This slot has a fun design with adorable love-heart shaped reels and a beach theme. Visit our site to learn more. 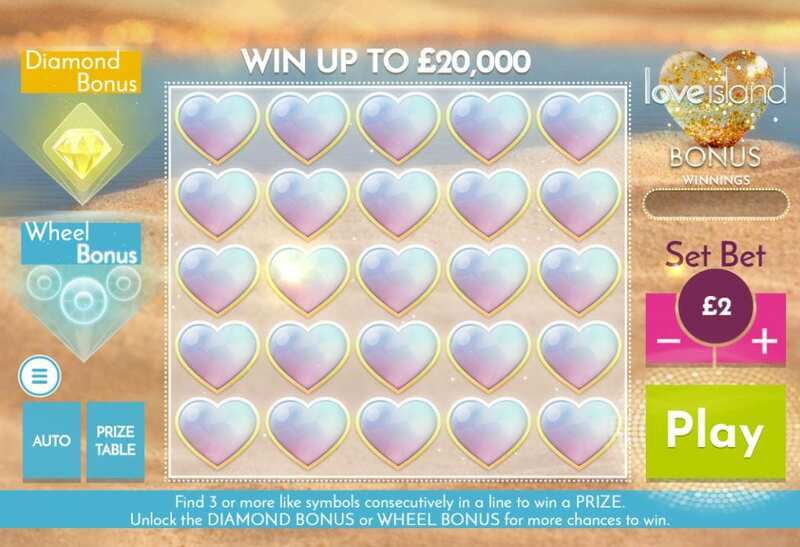 Love Island Bonus comes with a great set of features including a wheel bonus, diamond bonus and jackpot. Will you find love, money or a tan? Spin the reels to find out! Love Island Bonus is an exciting addition to the original Love Island slot, but with even more bonus features. You'll have a chance to head to the Love Island Villa to have a shot at winning the ultimate prize. You'll feel all the emotions from love to heartbreak with this fun game. The design is simple yet beautiful with a loved-up holiday theme. Behind the reels, you'll see the crystal blue sea, silky golden sands and clear sunny sky. The reels are all heart shaped which is a nice added touch to the game. The symbols include luscious pink lips, a delicate red rose, palm trees, a pound sign, a beach ball and a gender symbol. Make a match - There are 3 games in Love Island Bonus as well as 3 bonus features. The three games include game 1 where you reveal the winning symbol to create a winning combination, game 2 where you have to match 3 symbols to create a win and game 3 where you have to match 2 symbols in a column to gain a prize. Wheel Bonus - Landing 3 or more bonus symbols will unlock the bonus wheel of thrilling prizes. Diamond Bonus - The diamond symbol triggers the diamond bonus. Look out for the diamonds as these will increase your prize. When you find the 'collect' card, a prize will be revealed. Jackpot - There's also a jackpot in this game where you can win a maximum of £500, 000! If you're a fan of the hit reality TV show Love Island, then you will fall in love with this slot. It's a simple yet fun game with some exciting bonuses. The graphics are fairly effortless but nice and colourful. Love Island Bonus also comes with a phenomenal jackpot which gives you a chance to win up to £500, 000! If you enjoyed Love Island Bonus, why not try Asgard?